It was Beatlemania gone mad around Christmas 1964. The Beatles played a residency of seasonal shows at a theatre in West London from Christmas Eve right through the first few weeks of the new year. Paul played his Hofner bass, Ringo thrashed a Ludwig set, George switched between his Rickenbacker 12-string, a Gretsch Country Gent, and a Gretsch Tennessean, and John played his Rickenbacker 325. Until, that is, John got so caught up in all the excitement that he managed to do some serious damage to his workhorse Rick, dropping it off the Hammersmith Odeon stage. 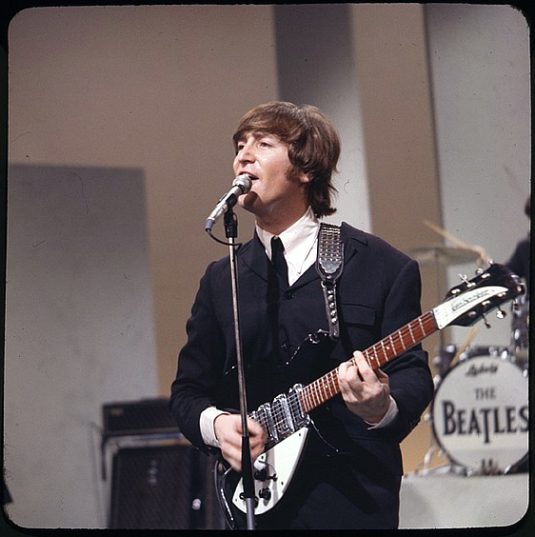 Lennon plays his Rickenbacker 325 on the Ed Sullivan show in 1965. Startled, John gave the guitar a quick once-over, turning it quickly this way and that. Relieved, he decided it looked alright. But when he went to play the guitar at the following night’s performance, he found the more he played it, the more it went out of tune. Between songs, he took a closer look, and to his horror he noticed a crack going from the nut around the back of the headstock. Oh dear, he thought. Or words to that effect. What to do? Rose-Morris to the rescue. John bought the first one during a working visit to Hamburg, Germany, in 1960. Then, when visiting America in 1964, he got a gift from Rickenbacker, which provided a replacement for that road-weary axe. It was this second 325 that suffered from John’s experiment with an airborne six-string at Hammersmith. 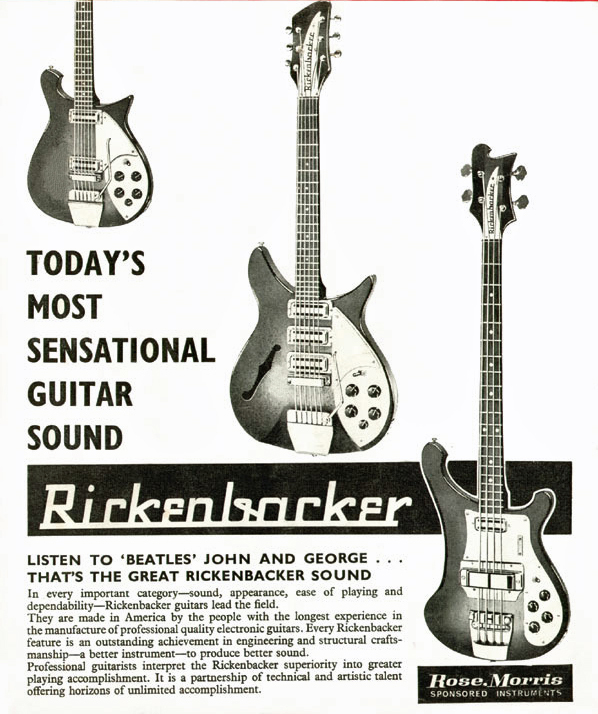 Meanwhile, the British instrument distributor Rose-Morris had taken on the UK agency for Rickenbacker and commissioned six versions of a number of models. Some were different when compared to the American originals, coming with a traditional f-hole rather than Rickenbacker’s no-soundhole or “slash” hole. And Rose-Morris renamed them based on an arcane numbering system: The “British” version of the Rickenbacker 330-12 became the 1993 in Rose-Morris’s sales material, for example, and the 325 became model 1996, and both had an f-hole in the body. It’s not difficult to imagine that it was Mal Evans, The Beatles’ trusty roadie and general dogsbody, who was given the job (once again) of sorting out the mess John found himself in. It was probably Mal who had to scoot across to Rose-Morris’s HQ in northwest London and pick up a stand-in Rickenbacker ready for the next day’s performance at Hammersmith, about an hour’s taxi ride each way through the busy holiday traffic. Rose-Morris was happy to provide one of its “British” 1996 versions of the short-scale 325, finished as standard in Rickenbacker’s fireglo red sunburst rather than John’s preferred black. Maybe it was Mal, too, who then had a go at repairing the ailing 325. John didn’t have to put up with the Rose-Morris model 1996 Rickenbacker for long. He soon had his regular 325 back in a reasonably playable condition, ready for the band’s first sessions of 1965 at Abbey Road. After the Hammersmith incident, Rose-Morris’s next move was an obvious one. The firm quickly put together an ad for the musicians’ magazine Beat Instrumental Monthly that made the most of John’s brief encounter with the model 1996. 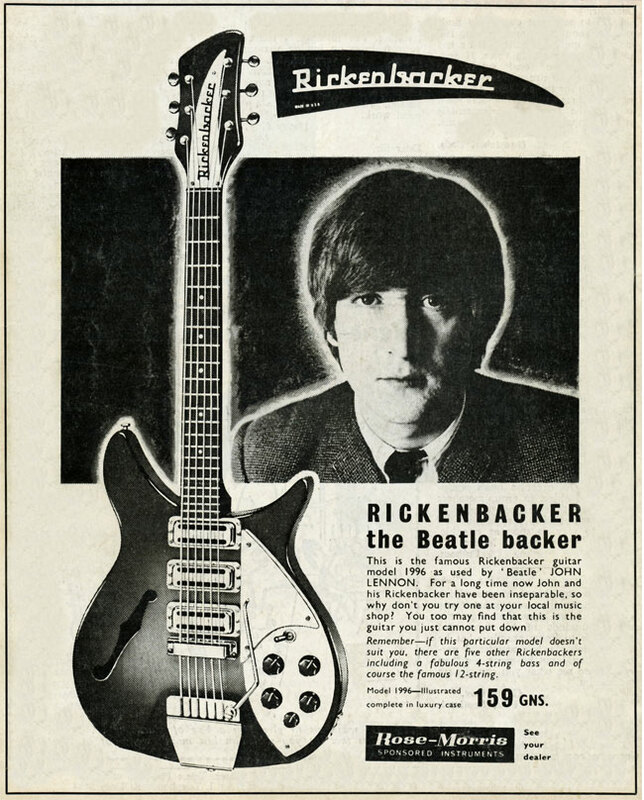 “Rickenbacker The Beatle Backer,” exclaimed the new ad, with a moody portrait of John next to a big picture of the f-holed Rick. Well, yes, John did use it—for an hour or two. 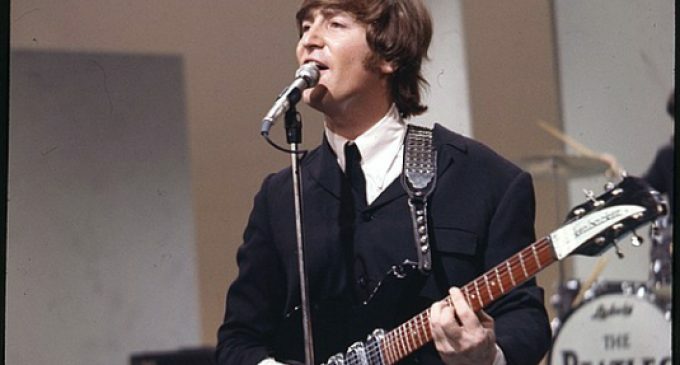 And he and his Rickenbacker had been inseparable—or at least John and his original Rickenbacker 325s had been. After the Christmas shows, John took the model 1996 home and shoved it in a corner, out of sight and mind. Eventually he gave it to Ringo, probably around 1968. In recent years, Ringo had a clear out and sold a bunch of stuff at auction, including the Rickenbacker. If Rose-Morris had ever got around to billing John for the guitar they gave him, it would have had a list price of 159 guineas. Some luxury British goods were priced this way, with a guinea worth one pound and one shilling. That put the Rose-Morris Rick at 166 pounds and 19 shillings, about $465 at the time, and roughly equivalent to some $3,700 in today’s money. But these kinds of calculations fade into insignificance when it comes to the results of Ringo’s 2015 auction. The ex-John Rickenbacker sold for a cool $910,000. Not bad for a stopgap Christmas gift. About the Author Tony Bacon writes about musical instruments, musicians, and music. He is a co-founder of Backbeat UK and Jawbone Press. His books include The Ultimate Guitar Book, Electric Guitars: The Illustrated Encyclopedia, and The Fender Electric Guitar Book. His latest is Electric Guitars: Design And Invention (Backbeat). Tony lives in Bristol, England. More info at tonybacon.co.uk.